Sometimes, recipes come from the most unusual places. While it’s normal to spot them as links posted on facebook, I was pleasantly surprised to stumble unto one nestled in a status message in my news feed. Regali Kitchen’s Chef JB described the dish in his facebook post as Haricot Verts Amandine. Fancy schmancy sounding right? But reading his quick and dirty instructions made me realize that it’s quite easy to make. 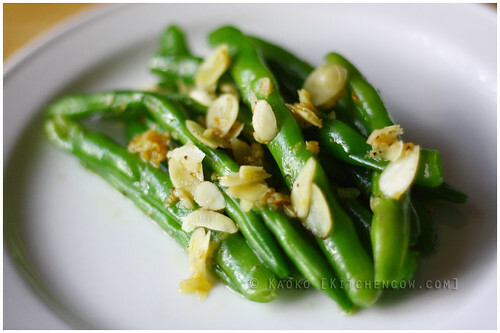 And it’s quite similar to how I usually prepare green beans — minus the almonds and the blanching. This version uses green beans. It was an unplanned kitchen attack; I didn’t have time to shop for French beans and normal green beans were all we had at the time. Despite the main ingredient substitution, it turned out pretty okay. No complaints from the table; just satisfied crunching sounds, so I guess it met my family’s approval. Saute garlic in one to two tablespoons of olive oil, set over low heat for a minute. Add almonds and beans, then saute on medium heat until beans are crunchy but not overcooked. This takes just a minute or two. Simple but delicious…this looks fantastic!